A brush fire that forced 2,000 people to temporarily evacuate their homes in the Santa Clarita Valley had scorched more than 1,000 acres and was 49 percent contained as of Sunday morning, firefighters said. The so-called Sage Fire erupted about noon Saturday near The Old Road and Calgrove Boulevard near Stevenson Ranch, according to the Los Angeles County Fire Department. More than 200 firefighters battled the blaze, which jumped from about 75 acres Saturday afternoon to 1,109 acres by Sunday morning. Residents were evacuated from 700 homes Saturday, but were allowed to go home at 9:30 p.m. 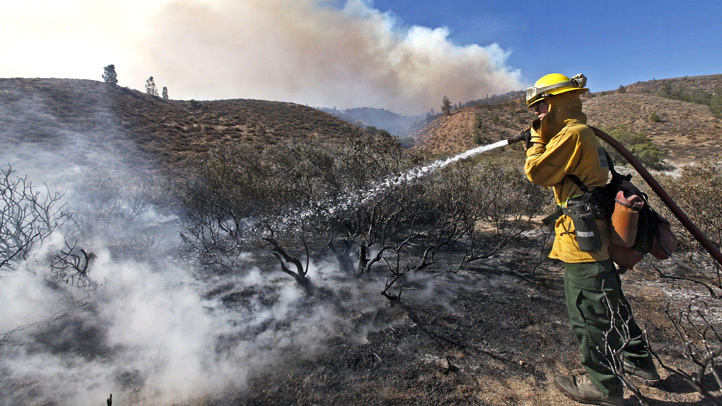 Firefighters faced a tough fight Sunday as hot, dry and windy conditions prompted a red flag warning in the desert and mountains areas of Los Angeles County. The South Coast Air Quality Management District issued an air quality alert for sensitive individuals living in the Santa Clarita Valley and Pomona areas. People with heart disease, asthma or other respiratory diseases living or working in the area were advised to minimize outdoor activities after air quality was determined to be unhealthy. There were no reports of homes damaged, although red fire retardant was dumped on homes as firefighters battled the blaze. One inmate firefighter suffered a minor injury and another firefighter was being treated for a heat-related injury, fire officials said. The cause of the blaze was under investigation.